What does Ageless by Thera Vita Hyaluronic Acid Serum do? Ageless by Thera Vita repairs scarring and discolorations caused by acne or rosacea, moisturizes your skin and brings back a youthful and radiant glow to your skin. Fine lines and wrinkles are minimized and your skin looks healthier and younger. Who should use the Thera Vita Hyaluronic Acid Serum? This hyaluronic acid with vitamin C serum is suitable for anyone who wants to improve their complexion, who is suffering from dry skin, acne, rosacea or who wants to reduce the signs of aging (fine lines and wrinkles) on their neck and facial areas. How do you use Hyaluronic Acid Serum? Unlike most of the other facial serums, the Ageless serum has a pump action dispenser. So you just apply a small amount of the serum to your face and neck after cleansing and once it has dried, apply your moisturizer and makeup if desired. Apparently, it also works well with a micro needle roller. Bottle with pump dispenser, large 1.7 fl oz (50 mls). Ageless by Thera Vita is 100% natural with no parabens, fillers, binders, artificial ingredients, no wheat, soy, eggs, milk or peanuts and includes Hyaluronic Acid, Aloe Vera, Witch Hazel, vitamin E, A and D and Lavender Oil. Hyaluronic acid is a well-known super hydrator which helps to retain moisture in our skins, due to its capacity to hold more than 1000 times its own weight in water. Some people in the cosmetics industry believe hyaluronic acid to be the next fountain of youth, simply because it rehydrates and moisturizes our skin so well. This added moisture also helps to plump-up our skin, giving it a more youthful appearance and a suppler and softer feel. Described as the plant of immortality by the ancient Egyptians, Aloe Vera is a well-known as a powerful healing agent for burnt or sunburnt skin. It is just as effective when used directly from the plant as when used as a gel. Aloe Vera is also of benefit in treating flaky or dry skin, and it is said to help relive the itchiness of psoriasis. It also helps in the treatment of acne, reduces skin inflammation and fights the signs of aging. Aloe Vera also contains many antioxidants, such as vitamin A, C and E, so it is an all-round great benefit to our skin. Long recognized for its anti-inflammatory properties, Witch Hazel helps to heal our skin from rashes and insect bites, as well as bruises and cuts. It is also used effectively to treat eczema and generally helps our skin to heal. It is also used as a moisturizer to prevent moisture loss from our skin and helps to heal sunburn and dry, flaking skin. As a natural astringent, Witch Hazel also helps to reduce oil in our skin, helping to both heal and prevent acne. There is nothing quite like the fabulous smell of lavender in the garden and it was used by the Romans to soften the skin, by adding lavender oil to their bathwater. Lavender oil also helps to reduce inflammation in our skin, so it’s great to treat redness, burns and eczema, and inhibits bacteria (so it’s good to treat acne). Vitamin E is a strong antioxidant that helps to heal and moisturize the skin. It has been long used in skin care products helps to fight the damage caused by free radicals, as well as rehydrate our skin. Well known to help treat acne, vitamin A also reduces wrinkles and increases the production of collagen and slows down the breakdown of collagen. So it is frequently used in anti-aging skin care products and it also helps in wound healing. Vitamin A also exfoliates the dry and dead cells from our skin, repairs our skins cellular structure, reduces brown spots and pigmentation, decreases the production of sebum and improves skin hydration. Whilst our skin produces vitamin D in the presence of sunlight, much is used throughout our body and its production is limited by our time in the sun and the use of sunscreens. Vitamin D itself, plays a critical role in the development of our skin cells and in their repair. Vitamin D is said to stimulate collagen production, reduce fine lines and wrinkles, lessen acne, reduce the appearance of dark spots and leave us with a more radiant complexion. L-Arginine helps in wound healing, collagen production and has documented anti-aging effectsa. it also contains anti-bacterial compounds which along with antioxidants helps to repair damage caused by free radicals. This is a form of sulfur which is essential in the production of collagen, keratin and elastin and helps to promote elasticity and tone to our skin. Used in skincare products it is said to create a radiant complexion and glowing skin, in fact it has been called the beauty mineral. When applied to our skin, MSM has a deep penetrating effect, producing more moisturized skin and promoting softer and more flexible skin. It can also help other ingredients in your skincare regime to penetrate the skin deeply. PROS: Nearly 90% of customers gave Ageless by Thera Vita a 4 or a 5 star rating. Favorable comments included that it was not sticky and that two pumps were sufficient to cover their face, that it reduced fine lines and wrinkles within a few weeks and plumped-up the skin. The pump action is easy to use and the packaging is really high end. Skin is less irritated, more moisturized and age spots have disappeared. CONS: There were a few customers who gave this hyaluronic with vitamin C serum a one star rating. Concerns were that there was no difference in their skin after using this product, and one person had hives (apparently she is allergic to lavender oil or to one of the ingredients in this product). Ageless by Thera Vita Hyaluronic Acid Anti Aging Serum – more customers reviews. The great majority of customers are more than happy with the results from the Ageless by Thera Vita serum, so unless you are allergic to lavender oil or any of the other ingredients in this product (the other main ingredients are Witch Hazel and Aloe Vera), then this serum appears to be a good choice. The sellers offer a 100% money back guarantee, so if you don’t like this product you will receive a full refund. 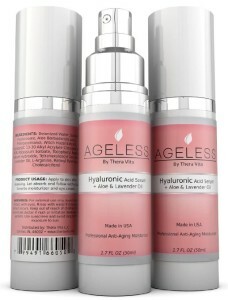 Check out today’s price for Ageless by Thera Vita Hyaluronic Acid Serum here. US Shipping: Orders over $35 receive free shipping. Australian Shipping: Please see my Shipping guide if you want to order this item as Amazon does not ship this O/S. International shipping is easy, it just requires an additional step in the process. a = Anti-aging effects of L-Arginine. 2010. Journal of Advanced Research.